Anil Ambani’s telecom ambitions are almost credible again. The Indian tycoon’s Reliance Communications is in exclusive talks to sell its mobile phone towers and other assets to U.S. investor Tillman Global and private equity firm TPG Capital. The deal could at least halve RCom’s $6 billion net debt, leaving it ready for future battles. The group, which has a market value of about $3 billion, is the last of India’s big telecom groups to raise cash by hiving off its towers. The three biggest operators Bharti Airtel, Vodafone, and Idea Cellular combined their towers into one privately held company, Indus Towers, which has been around since 2007. In October, American Tower picked up 51 percent of rival Viom Networks – which owns slightly fewer towers than RCom – for around $1.2 billion. By selling and leasing back its 43,379 towers, which it would then lease back, RCom could raise around 215 billion rupees ($3.2 billion), the Business Standard reported on Dec. 5. The acquirer can boost returns by increasing the number of operators that use each location. RCom might pocket another 75 billion rupees ($1.1 billion) by offloading the nationwide optic fibre that forms the backbone of its fixed-line business, the newspaper added. The disposals will help repair a balance sheet battered by high spectrum costs and cut-throat competition. RCom’s net debt stands at more than 5 times its EBITDA, based on annualised earnings for the six months to September. Around half its borrowings are due over the next two years, according to CLSA. Deleveraging will allow RCom to focus on increasing its market share. Indeed, the number four player in the Indian wireless market could become a much more formidable opponent. It recently bulked up its spectrum by buying the Indian unit of Russia’s Sistema. That deal prepares it for a plan to share airwaves with Reliance Jio, which will soon roll out fast data services. The start-up happens to be backed by Anil Ambani’s richer, older – and no longer estranged – brother Mukesh. An industry price war is likely to follow. Raising cash now will better prepare RCom for the battle to come. India’s Reliance Communications said on Dec. 4 that it had signed a non-binding term sheet to sell its tower assets and related infrastructure to Tillman Global Holdings and private equity investor TPG Capital. Under the agreement, RCom will transfer its towers business to a special purpose vehicle wholly owned owned by the U.S. telecom and energy infrastructure investor and the private equity group. 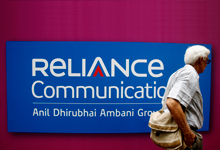 RCom will remain an anchor tenant of the towers after the sale. Tillman and TPG will also evaluate the purchase of RCom’s nationwide inter-city and intra-city optic fibre assets in a separate independent transaction. No financial details were provided. The companies will remain in exclusive talks until Jan. 15. Any deal is subject to due diligence. RCom said that it will use the proceeds to pay down debt.